Boise Goathead Fest's PEDAL-POWERED PARADE is here! 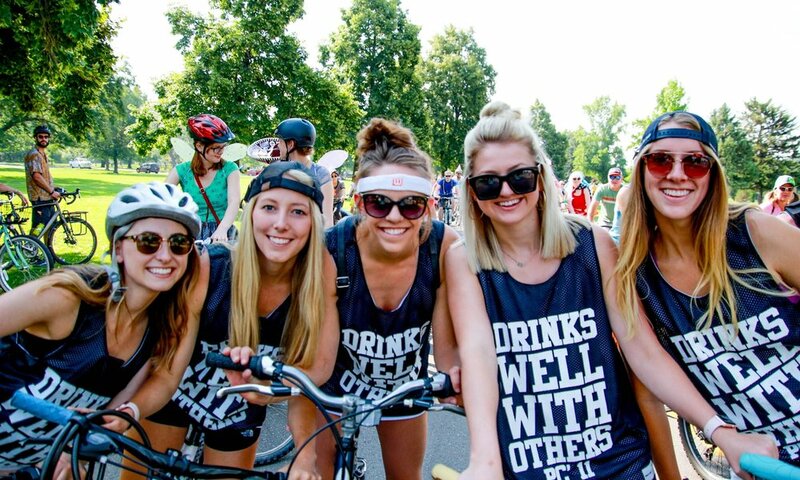 Boise has become well know for hosting the one of America's largest bicycle parades during the Tour De Fat. This year Boise Goathead Fest is continuing that momentum, pumping up the PEDAL-POWER, magnifying the WONDERFULLY WEIRD, and amplifying the BONA FIDE BOISE IMPACT! Within three years, we believe Boise Goathead Fest will host the largest Pedal-Powered Parade in the country. 9am Kids Face Painting and Bike Decorating Party, + Coffee From Dawson Taylor! $5 recommended donation to participate in the parade. You can register as an individual, couple, family, or find/start your own team! Your nonprofit choise will also designate who your beverage, food, and BGF merch. benefits. Our goal is to raise over $50,000 for Boise's bicycle nonprofits in the first year! If you're on the "Rolling Solo" team, the theme is Monster Mash! Boise Bicycle Project is: Nonprofit Bicycle Cooperative that works hard to make sure everyone regardless of income or background has access to a quality bicycle, the tools and knowledge to keep that bicycle running, and the support to continue their pedal-powered journey. Boise Bicycle Project believes: A bicycle is a tool that creates opportunity and connects people to their community. By creating a safe space where EVERYONE is welcome, and by building partnerships with other like-minded organizations, BBP hopes to build a community of vibrance, compassion, innovation, and positive collective impact. Boise Bicycle Project is stoked about Boise Goathead Fest because: This is an event that celebrates the entire bicycle community. When we share space and ride together, there is nothing we cannot do! We also donate about 1000 bicycles to kids every year and are stoked that flat tires for these kiddos and all types or riders might soon be a thing of the past! Dirt Dolls is: A women’s mountain biking group that began with a few passionate women and has grown immensely to a team of shredding divas. Our goal is to inspire women to pedal through support, encouragement, and education and by eliminating intimidation and negative stereotypes surrounding the sport of mountain biking. In addition to weekly rides, we aim to spend time helping out in the community and supporting as many bike-related events as we can. We are operated 100% by volunteers, and we are so grateful for the support. We love meeting new people (especially beginners! ), we love to pedal, and we want to share our sport with the world. Dirt Dolls believes: Generosity and kindness go a long way. We believe by offering an open environment for all riders, we are able build bonds and relationships in our community as well as gain bike skills and promote good times! Dirt Dolls is stoked about Boise Goathead Fest Because: This is a super cool opportunity for everyone in our community to celebrate the passion many of us share for biking and the massive disdain we share for goatheads! We support the mission of all the nonprofits involved and are thrilled to be a part of this rad event in our stellar city. 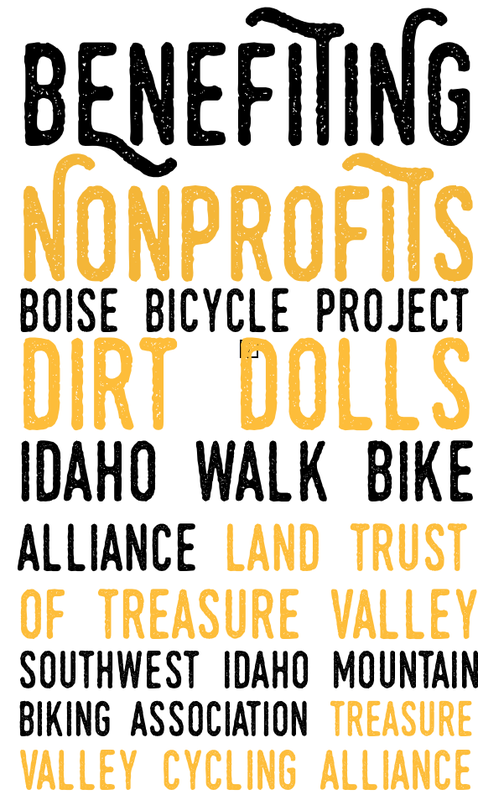 Idaho Walk Bike Alliance is: a statewide walk/bike advocacy organization. We are a nonprofit 501(c)3 funded by private foundation grants and your donations to promote active transportation as healthy, safe and reliable for all Idahoans. Idaho Walk Bike Alliance believes: you should leave your car parked and unused as much as possible; we work for equitable funding for walk and bike infrastructure at the state and local level so you are safe when you travel without your car. We lobby the state legislature for funding and advise communities across Idaho on how to obtain more funding for walk and bike projects. Idaho Walk Bike Alliance is stoked about Boise Goathead Fest Because: we HATE Goatheads. Bicyclists hate goatheads. The reason is obvious. And walkers hate them as well. They get stuck in your walking shoes and make your pets limp. We are behind anything that turns evil goatheads into funds that make it possible to make it safer for those who choose to walk and bike. We also like to hang out with walk and bike people and drink beer or a non-alcoholic beverage. Land Trust of the Treasure Valley is a community supported nonprofit since 1996, working side by side with the general public, private landowners, like-minded organizations and public agencies to achieve shared goals to protect OPEN SPACE in the Treasure Valley, focusing on the foothills of the Boise Front and the Boise River. Land Trust of the Treasure Valley believes in Conserving Nature Close to Home! Land Trust of the Treasure Valley is stoked about Boise Goathead Fest Because we believe connecting kids of all ages to nature is important in this day and age! We believe when kids learn to enjoy and understand the natural world, they are more likely to value nature and the outdoors throughout their lives! We will use our Boise Goathead Fest funds to promote our unique programs which include 'Wild Outdoor Week', 'Bird by Bird' and other unique learning opportunities throughout the year! Southwest Idaho Mountain Biking Association (SWIMBA) is A rider advocacy organization dedicated to building and preserving a world-class, multi-use trail network in Southwest Idaho; educating trail users; and protecting the rights of mountain bikers. SWIMBA believes in creating a diverse, inclusive mountain bike community that welcomes everyone! SWIMBA is stoked about Boise Goathead Fest Because it gives us the opportunity to talk about our new direction and how vital the participation by mountain bikers is in the planning and design of our trail network. The Southwest Idaho Mountain Biking Association (SWIMBA) is a 100% non-profit, volunteer organization dedicated to building and preserving a world-class, multi-use trail network in Southwest Idaho. Treasure Valley Cycling Alliance (TVCA) builds better communities by encouraging more people to bike and by advocating for safety and bike-friendly infrastructure. TVCA believes everyone in the Treasure Valley should live life in the bike lane by having access to bike-friendly routes. TVCA is stoked about Boise Goathead Fest because we love to see people riding bikes, sharing in their community, and having fun!